Ever heard of Singles Day, 11/11? It’s a yearly observance that dates back to 1993. What started out as college kids’ gratifying response to flying solo on Valentine’s Day is now an ongoing movement – one so popular that the day sees $1 billion of merchandise purchased on an hourly basis in the largest retail market in the world, China. This officially makes Singles Day the most anticipated, online and offline shopping day in the world. It’s Amazon Prime Day on steroids, and you don’t have to live abroad to celebrate it. You deserve to treat yourself to a little something extra every now and then…and this is the perfect time to celebrate your individuality. When you don’t have someone to keep you warm in colder weather, this long-sleeved, faux fur, NadaFair turtleneck has your back. Doubling as a stylishly warm, pullover, the sweatshirt makes a fabulous match with a pair of blue jeans. The patchwork pattern across the chest enhances this stylish, casual look for the fall and winter season. Available in small to extra-large sizes, choose from black, blue, brown, and white/pink. In any social circle, communication is king! Whether you’re chatting with friends or making plans for the weekend, you should have the best of both worlds in technology at your fingertips….like a phablet. The Coolpad Cool1 Dual 4G Phablet combines a larger 5.5-inch screen (like a tablet) with the compact convenience of a smartphone – ideal for home, school or office use. Other features to consider include triple camera capabilities (including dual rear cameras), fingerprint unlocking, a large battery capacity, gravity sensor, and multi-language options. You’re long overdue for a relaxing, night’s sleep! Now is the perfect time to say ‘goodbye’ to saggy slumbers, tossing and turning all night long, and sour dreams. The Serta Castleview Cushion Firm Pillowtop Queen Mattress Set isn’t just any bed; it’s a limited edition stunner that combines Cool Twist® Gel Foam with an individually wrapped innerspring coil system that delivers targeted slumber support. The standard 9″ StabL-Base® box spring and mattress work together to relieve pressure points and provide ample cushioning for the body. Another perk? White Glove Delivery. No need to worry about set-up or getting rid of your old mattress – they’ll haul it away for you. Treat yourself to a spa day without ever leaving the home. One of the best ways to set the mood in a room is to clear the air and replace it with positive, uplifting scents. The LuckyFine Essential Oil Diffuser does just that, as a dual aromatherapy diffuser and energy-efficient, air humidifier. With this model, you’re spoiled with a lot of options. There’s seven LED light effects that switch color or stay on a single hue. You can adjust the brightness, spray effects and duration settings. Activate the mist mood and just relax. Play with different essential oils: melt away stress with lavender, get earthy with patchouli, or put some pep in your step with cooling peppermint. This air fryer really “stirs” up joy. Make every day feel like “fry” day with the Cyclone Rotating Digital Air Fryer by modernhome. A 7-quart capacity means room enough to feed the whole family their favorite meals. From fresh veggies, to meats, poultry, and even desserts, this fryer serves up healthy portions (both in nutritional value and in size!) of everyone’s favorites in no time. A self-stirring arm ensures food cooks evenly, and touch-activated controls make it easy to precisely set temperatures and cook times. If Singles Day sounds like your kind of holiday, and you’re not done giving yourself all of the individual attention you deserve, make sure to download our Giving Assistant Button. We’ll make sure you fall in love with plenty of deals, discounts and savings all year-round. It’s that time of the year again, when promotional sales are at an all-time high, and eagle-eyed, deal watchers are able to snag the lowest prices on gifts for family and friends. Black Friday traditionally marks the kickoff of Christmas and holiday shopping in the U.S. Many savvy shoppers wait all year long just to take advantage of the deep discounts and unbelievable markdowns. To get you started, check out these Black Friday gift ideas you won’t want to miss. This Macy’s-exclusive 2.6 Qt. Touchscreen Air Convection Fryer from Crux packs 1,500 watts of circular heat power that evenly cooks and crisps all of your fried favs without using gobs of grease. Bet you didn’t know you could make handheld Apple Pies with Bourbon Caramel Sauce in an air fryer? Besides churning out multiple batches of crispy French fries and wing-dings, the fryer also roasts, grills, cooks frozen food, and even bakes muffins, breads and custards for dessert. The basket holds 2.5L of food, making it a highly versatile gift for newlyweds, college kids, and small families. Reaching temperatures of up to 400°F for up to 60 minutes, other features include digital touchscreen controls, an auto-shutoff timer, and chic copper accents. When gift-shopping for the fashionista in your life, accessories are queen! 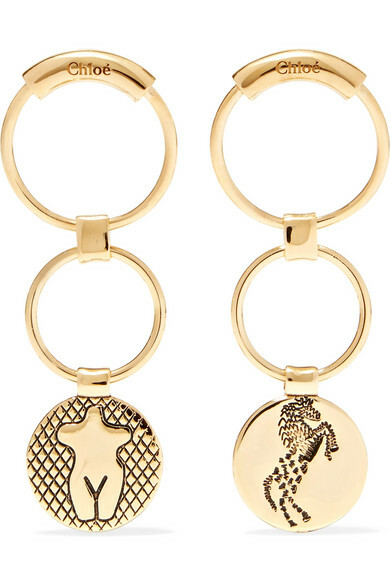 CHLOÉ Femininities gold-tone earrings offer a series of signature rings that embodies the energy of female empowerment and features two of the brand’s most sought-after motifs. Prancing ponies and the statuesque ‘Femininities’ emblem (inspired by ancient fertility art) are the highlights of this mismatched pair of ear bling. With a 6.9cm drop, these Italian-made beauties may give off a larger-than-life presence, but actually have a surprisingly lightweight feel to them. Need another NET-A-PORTER gift suggestion? How about the signature, hard-to-overlook, distinctive pattern we all know and love with a practical twist: Burberry’s checked canvas and leather cardholder. It’s a real show-stopper. Black leather and multicolored canvas are paired together to offer an eye-catching luxe gift idea for the accessories hound. Carry cash in the zipped pocket, while backup funds and I.D. fit into four card slots. Just the right size for any on-the-go adventure – the holder doesn’t take much space up inside a purse, and is compact enough to slip into a pocket. The stainless steel Samsung 25.5-cu ft French Door Refrigerator represents one of the most popular styles in refrigeration. Not only does it provide a more convenient, eye-level view of foods, shelves and crisper drawers, but also looks pretty fabulous while doing it. The CoolSelect Pantry full-width drawer comes with separate temperature controls; ready to store a holiday party platter or safely defrost tonight’s dinner. Store frozen foods in the EZ-Open handled, bottom drawer, which holds the ice maker with easy-access bulk ice storage. Another perk? ENERGY STAR certified products, like this fridge, help save money on utility bills with all of the style, convenience and high-performance you’d expect from a modern kitchen appliance. Binge-watch the final season. Super-size game day touchdowns. Netflix and chill. Whatever their pleasure, a VIZIO D-Series 55″ Class Smart TV is a gift that keeps on giving all year round with 4K Ultra HD resolution – that’s four times the detail of 1080p Full HD! This model comes equipped with Smart TV features that are quicker and easier to navigate. They’ll gain instant access to the most popular apps and their can’t-live-without favorites. Built-in Chromecast means no need to buy an extra accessory to instantly stream movies, shows and music. Gift-worthy for new homeowners, art enthusiasts, and baby nurseries, there’s something relaxing yet stimulating about botanical art, like the As Collective Leaf Set of art prints. This Mother Nature-inspired trio certainly breathes life into a room with rich strokes of blue and green – accompanied by versatile yet uncomplicated, white molding that frames the prints. Each art print (“Milkweed I,” “Leaf I,” and “Milkweed II”) measures 16″ x 13″; is printed on fine art paper; and comes ready to hang in a bedroom, living room, den or office. For some, achieving an intensely-relaxing night’s sleep is a gift sent from heaven; exactly what the TEMPUR-ProAdapt™ aims to deliver. Say ‘hello’ to one of the newest mattresses in the Tempur-pedic lineup. Constructed to provide multiple layers of luxurious comfort, support and advanced pressure-relief, the ProAdapt promotes the kind of rejuvenating sleep many rarely achieve. Personalize the comfort level with Soft, Medium, Medium Hybrid and Firm options – available in a variety of mattress sizes, from Twin to Split CA King. And then, snuggle deeply without a care; there’s a 10-year limited warranty on this mattress, which Tempur-pedic will repair or replace it for free, if needed. This classically rustic wine cart from the Home Depot is the perfect excuse to fill your home with friends this weekend: not only is it show-off worthy, it holds up to 14 bottles of your favorite wines (plus, all those wine glasses) so you can keep your friends topped off and happy all night long. Bonus: it’s extra-portable, too. Smooth-rolling castors make it easy to keep things moving when it’s time to relocate, update a room, or just bring the party a little closer, while easy-locking wheels keep things safe and secure. 8. Walmart | Play Time! Research proves that outdoor play is not only important for kids’ physical health, but can improve their performance in school, and support their emotional wellbeing to boot. Thankfully, the Backyard Discovery Tucson Cedar Wooden Swing Set can help bring health and happiness to both the kids in your life, and to your bank account. A sturdy seating area takes outdoor snacks and crafts where the action is, while an 8′ slide, trapeze bar, and rock wall (all safety tested and certified) serve as an exciting outlet for those pent-up wiggles. Even better: this playset boasts a quick a seamless setup. In as little as a day, this is a holiday gift that could transform any backyard into a lifetime of happy, childhood memories! A pair of Evan X Basic Buffalo Jeans, David Bitton-style is just what the man in your life needs to bring in the holidays right. Offering a seductively slim fit in their ‘Dark and Authentic’ wash, these men’s jeans are 98% cotton with a lil’ bit of elastane thrown in for good measure. In addition to bearing the signature Buffalo patch, these jeans offer a fashion-forward combination of features, such as button fly and single button fastening. Striking stitching catches the eye throughout, including on the belt loops and pockets. Black Friday is one of the best times of the year to find bargains on jewelry, appliances, electronics, and home goods. To make sure discounts on the perfect gift don’t pass you by, stay on top of the latest deals by downloading our Giving Assistant Button.